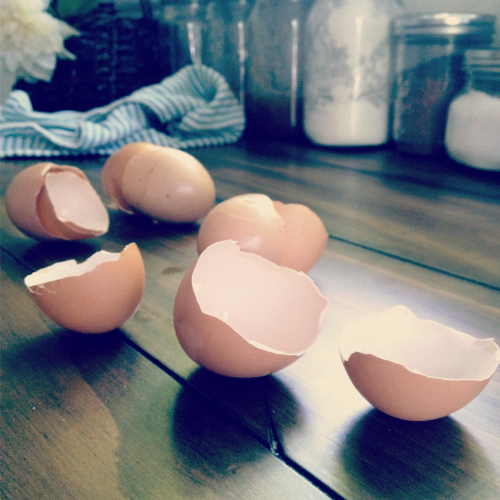 Did you know you can reuse eggshells in dozens and dozens of different ways? My mom has a flock of pastured chickens and she's done this for years. She sterilizes them in the oven, crushes them up and feeds them to her hens as a calcium supplement. It helps give their eggs harder shells in addition to a number of other health benefits. in compost. We have a huge compost bin on the backside of our property and adding used eggshell adds valuable mineral content, especially if your intention is to use the rich composted soil in your garden beds and flower pots. pest deterrent. Sprinkle crushed up shell around the base of plants to keep keep slugs, snails, and other plant eating worms at bay. Though we don't have this issue in the city, I've heard it helps repel deer as well. added to bird feed. In the same way it's good for chickens it also great for wild birds. (don't forget to sterilize! 20-30 minutes in a 250 degree over spread out on a cookie sheet will do the trick) It's particularly helpful for their digestion and in Springtime when they're laying eggs. I simply mix it in with my regular feed. a few uses we haven't tried yet but want to include: DIY sidewalk chalk (genius! ), as tiny planters to get seedlings started (also genius! ), to make coffee less bitter by adding it to the grounds during brewing, and as an added supplement to dog food. Aren't those fantastic?! I will never throw an egg shell away again, especially the crazy healthy pasture-raised variety I call my mother's. ;-) They're too valuable! It should be noted, I would not personally recommend reusing standard conventional eggs. For a number of reasons, primarily health related. See The Story of an Egg or Fowl Play for more.